Sometimes I make a list of what we’re going to eat throughout the week; sometimes we abide by the list, and sometimes we don’t. 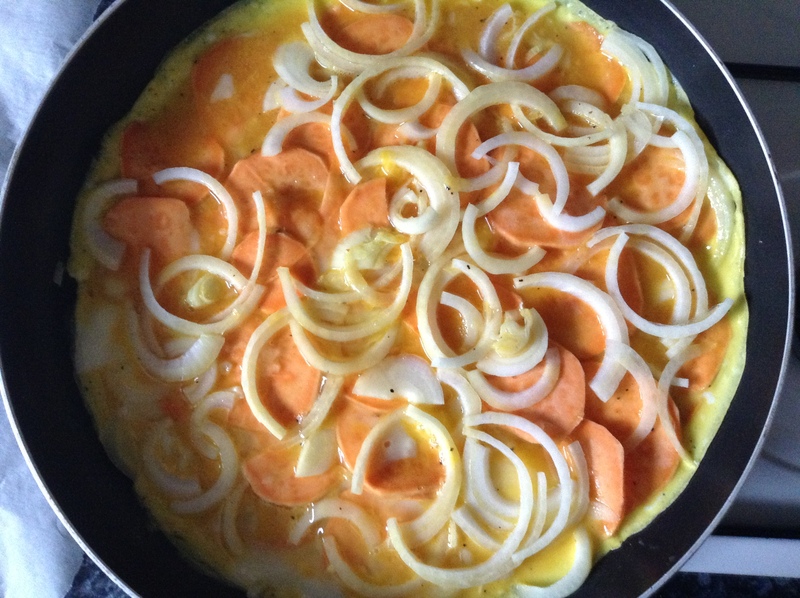 On this particular day we failed to plan for our planned dinner and had to make due with what was available, which turned out to be sweet potatoes, onions and eggs. What else was there to do but make a tortilla? I think Spanish tortillas are the subject of quite a lot of controversy. It’s not authentic with onions. It’s only authentic with onions. It’s not authentic unless it’s four inches thick and has been cooked in 2 liters of olive oil. It’s not authentic unless it’s cooked with Spanish potatoes grown on a Spanish hillside 113 miles outside Barcelona which has been grazed by Spanish goats. You can only use waxy, not floury potatoes. You’ve got to let the cooked potatoes and onions (if you’re an onion believer) sit in the egg mixture for up to an hour to let the flavors meld. Good grief, it makes you exhausted just thinking about it. Unafraid of committing such culinary faux pas as those mentioned above, I layered up thinly sliced, uncooked sweet potato and uncooked onion – season each layer if you are paying enough attention to remember to do this – in foaming butter – no olive oil to be found! – and poured over the egg mixture, which also had no olive oil. I cooked this over a low heat for 15 minutes and then flipped it over for another 15 minutes. Sprinkled with paprika and cilantro (coriander) and we were away! 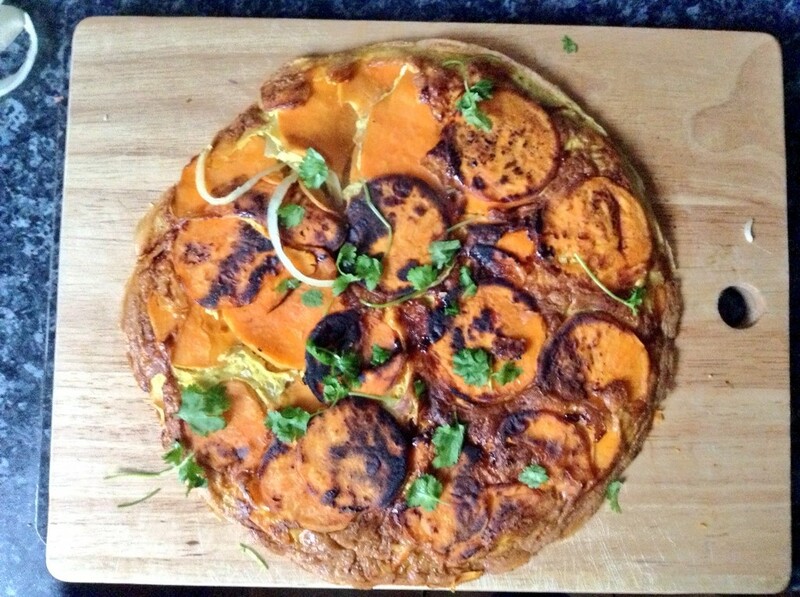 For those of you interested in recreating an authentic Spanish tortilla, disregard what you read above and check out this article. That sweet potato dish looks awesome. I wish I could pull something like that off without the inevitable kitchen disaster. Thanks for the follow! I am flattered! There are plenty of those and they even get posted sometimes too! Steamed Pork Buns are a case in point. I’m looking forward to reading your stuff! OH my gosh…this looks AMAZING!! Thanks! Thanks for taking a look!